First off, I want to extend warm Holiday wishes to all of you reading this blog!! As I sit at home on Christmas Eve morning, I am quietly reflecting back on a big year of accomplishments and changes I experienced in 2010. It is often hard to take time to appreciate your blessings, Because as a society we are driven to conquer the “next thing.” However, I have been trying to get better at taking time to savor life’s victories. Last year, I ran my first marathon (thankfully under 4 hours despite horrible cramps), sold my successful 10 year-old fitness business in Ohio, and moved to North Carolina to tackle a new venture at the Athletic Performance Center. The past year has truly been full of many changes and blessings. Over the years, I have come to realize that the real gift in my profession is being able to help others. For me, I have an ability to reach consumers through my rehab and performance training, as well as my peers through blogging, speaking and products. If you read my blog, I hope that I have been able to help you even if it is only in the smallest way. As I look ahead to 2011, I am excited for new opportunities and feel like it will be a big year of learning and exploration for me. That will translate into more sharing on this blog and in my monthly Training & Sports Medicine Update Newsletter. I am continuing to write for PFP Magazine through my online column and will share my latest post with you today on crossing lunges. Performing a crossing lunge presents unique challenges to the body – challenges which often exploit muscle imbalances, mobility issues, and balance deficits. It is a rotational activity that is more challenging then it may appear. I once had an athletic trainer question the safety of them in an exercise class I was teaching. She thought they were harmful for the meniscus in the knee. Hmmm…. If that is true , why would I do them? Well, like any exercise you do in the gym, there is always risk of an injury IF you do the exercise improperly. That is a key takeaway point. For the record, I never recommend an exercise I think is dangerous – in most cases it simply comes down to form and knowing your limitations. Crossing lunges are very effective in strengthening the entire lower body, but particularly the hips. Whether choosing the backward or forward variation, they call for hip internal/external rotation, knee stability and ankle mobility. Beyond that, they are very functional for sport and athletic movement. Think about field or court sports for a minute. How many times does an athlete cross over to dribble, scoop up a ball or evade a tackle? You may see the forward variation more, but the backward variation is seen as well with drop steps, pivot motions and even along the baseline in tennis. So, if you train athletes or are an athlete, this is a great example to keep in your personal exercise tool box. I have included pictures of the forward and backward version below. See the link below the photos for my full column and explanation of how to do the exercise properly. 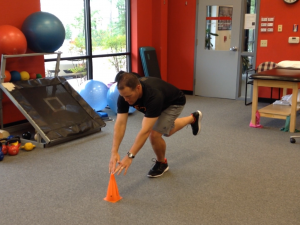 Click here to read my full online column, Functionally Fit, pertaining to this lunging exercise. Thanks for reading this, and I wish you all the best in the year to come!